US correspondent John Lamm sniffs out what's on show in the Big Apple. New York's annual auto show is now 109 years old, so it has seen tough times before. But the local auto dealers do this show, so naturally there was a different tone than at the major shows supported mainly by automakers. So some might argue the Big Apple's show was a bit sombre, and certainly not as crowded on press days as in the past, but there was still glitz. It is, after all, New York City. Arguably the most important launch, from an international standpoint, was Subaru's Legacy, which looks like a nice, logical step from the last version. Mitsubishi showed the Outlander GT concept and said it is about what the production version will look like, minus the Brembo brakes and big wheels. The sport utility craze may be on the wane in the U.S., though lower gas prices are slowing its demise, and New York showed that automakers are not about to give up on SUVs. Acura ZDX is this division of Honda's apparent interpretation of BMW's X6. Designed completely in the U.S., the ZDX is based on the company's MDX sport utility... good looking but lacking some of that utility. This vehicle will go into production this fall with little change from what you see here, probably powered by a 3.7-litre, 224-plus-kW V6. And BMW showed the next step in the X6's development, the M version. It still has the twin-turbo 4.4-litre V8, but with added boost and more tuning, horsepower goes to 408 and torque to 678Nm, while 0-100km/h drops to 4.5 seconds. Naturally all the other elements get firmed up, and they've added a launch control for BMW drag racers. Still in the big dog category, GMC launched its version of the Chevrolet Equinox, the Terrain. Looking like a light-footed Hummer, the squarish Terrain is a 5-passenger that may look rather rugged, but its base engine is a 136kW direct-injection 2.4-litre four. This should quiet GM's critics, but one suspects the big seller will be the version with the 197kW, 3.0-litre V6. While the Jeep Cherokee may look rather like its predecessor, under the skin it's quite different... and quite Mercedes. Still relying on their old partnership, the Cherokee is based on the platform of Mercedes' ML sport utility, and so makes the move to independent rear suspension. Engines are from Chrysler, either a 3.6-litre V6 or, as you would expect, a Hemi V8. Land Rover showed updated versions of the Range Rover and the LR4. Other than grilles and taillights you'd be hard-pressed to spot what's different, though the interiors are upgraded. Mercedes made a move to improve the gas-respectability of its ML with the ML450 Hybrid. This matches an Atkinson-cycle V6 with a pair of electric motors and 4Matic all-wheel drive for a total of 250kW and 517Nm with claimed fuel economy of 11.2L/100km city and 9.8L/100km highway. Nissan displayed its 261kW Nismo version of the 370Z, which cuts 0-100km/h time to 4.5 seconds, along with the roadster version of the sports car. Ah, but of all the vehicles unveiled at New York, which would I most like to drive? 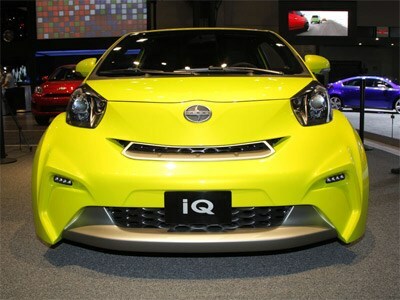 Okay, it only has 69kW, but the Scion version of Toyota's IQ, finished off with a wide body kit and green that would burn your eyes in the bright sun, looks like a hoot.